I’m not one to do a lot of decorating for Valentine’s Day, but I do like to do a little something as a nod to the holiday.When the kids were younger, I did much more in terms of decor and gifts. However, this year I wanted to keep it simple while still making it feel festive! Nowadays my Valentine’s Day decorating basically consists of bringing in a little pink – just enough to chase away those winter blues! I mean, a few pink flowers are always a good idea don’t you think?! 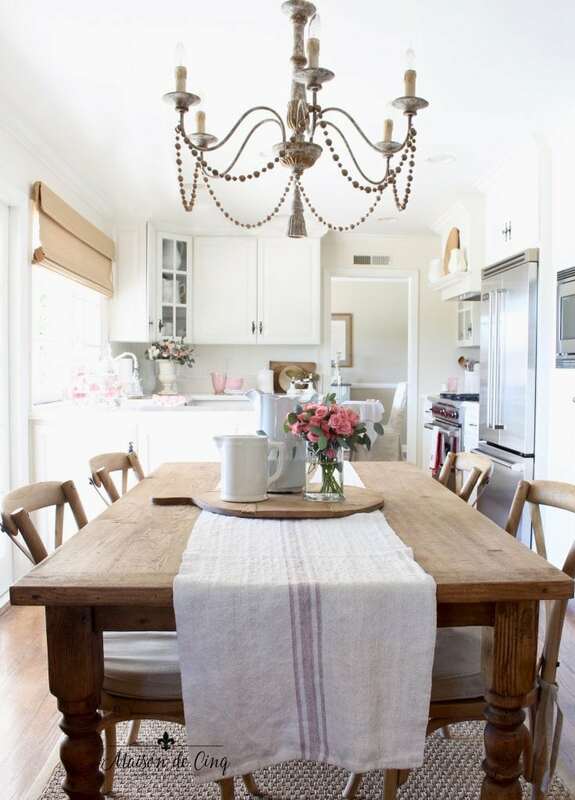 The kitchen table is a focal point in this room so it’s one I like to decorate with the seasons. 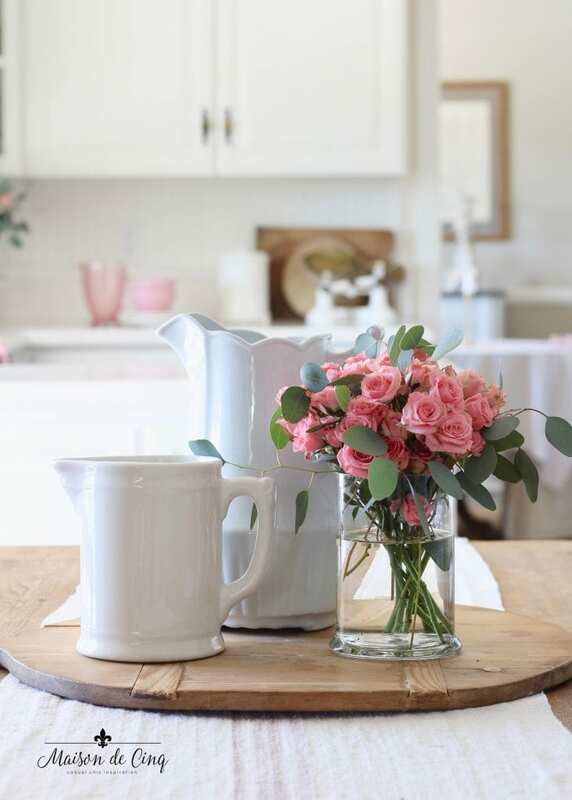 For Valentine’s day, I used the tiny pink roses I bought for my Valentine’s Day table setting, and combined them with some white ironstone pitchers to create a little vignette on the table. 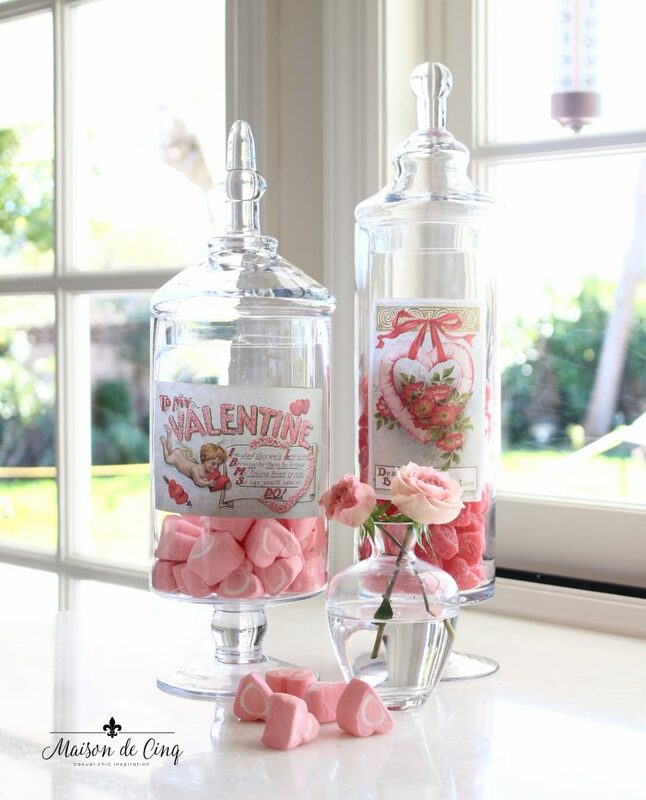 One of my favorite Valentine’s Day decorating ideas is to use these apothecary jars! I purchased some vintage postcards on eBay and then hot glued them to the jars and filled them with pink and red candies. How cute are these?! What’s amazing is they all have the original dates and notes – it’s so fun to read them and to see that people used to send Valentines to everyone they knew! I bring out any and all pink that I have! 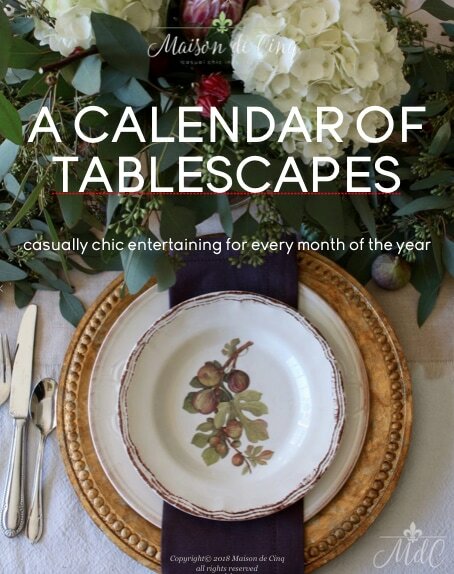 These bowls are a favorite (I have them in white as well) and the hobnail pitcher I purchased last year. I love it’s vintage feel! 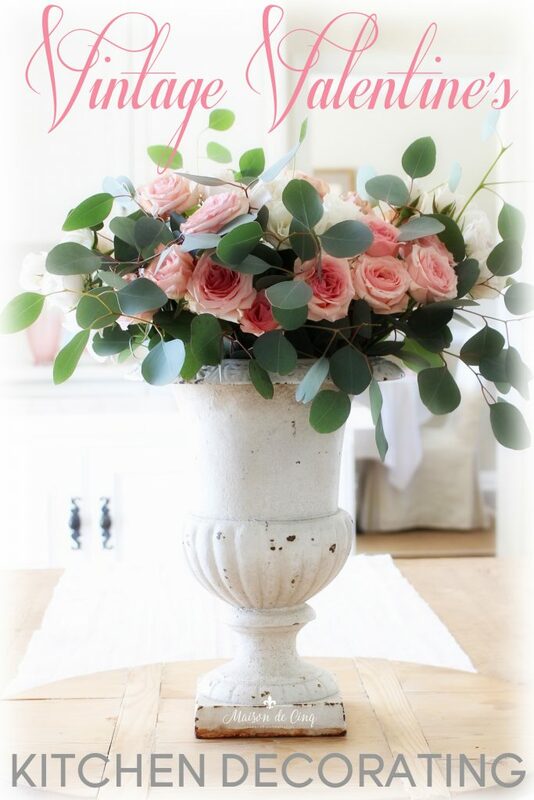 More roses in my favorite vintage French urn. All the little touches of pink just make the room feel so happy. 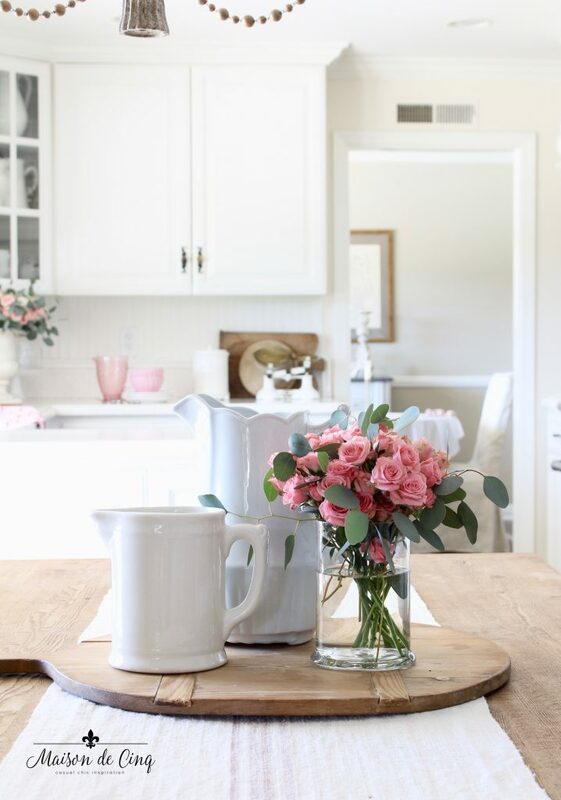 I love that just a few pink flowers can brighten up the whole space! 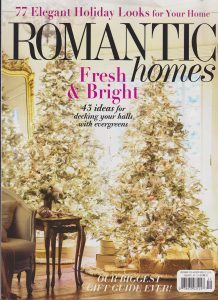 For more ideas on styling flowers – as well as tips on how to keep your fresh flower buying within budget – check out my post How to Decorate with Flowers: 7 Easy & Stylish Tips! 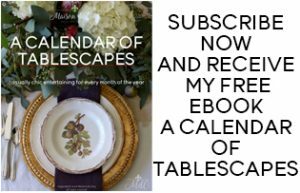 Thank you for joining me today, and be sure to check out all the wonderful bloggers also sharing their Valentine’s Day decorating and celebration ideas below! 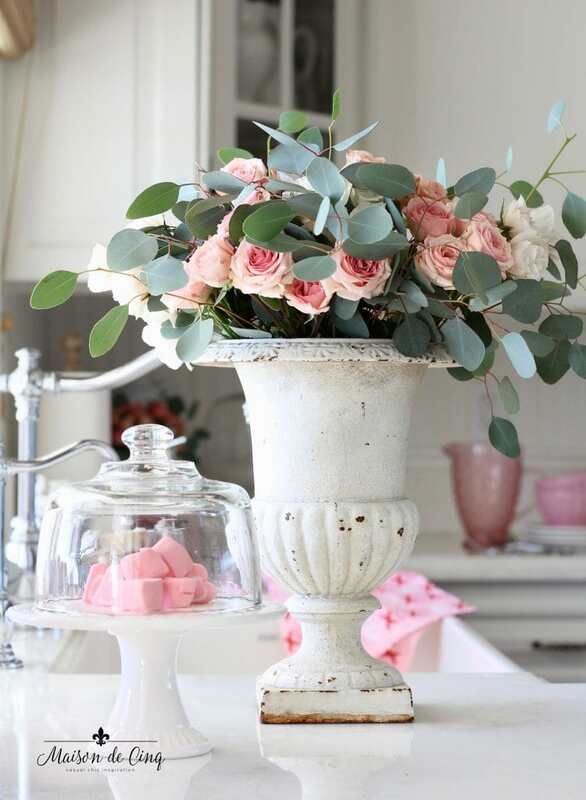 Nothing speaks romance and Valentine’s Day to me more that those soft pink roses in the vintage French urn. That’s so kind – thank you so much! OK Sheila, you know those pink pieces are tugging at my heart strings! And that urn is just gorgeous! I’m absolutely adoring the postcard idea on the apothecary jars! I need to do something like that. Just too darn cute! Thank you so much for joining us and sharing your beautiful ideas! Thanks so much Summer! And thanks for having me! Sheila this is all so pretty! 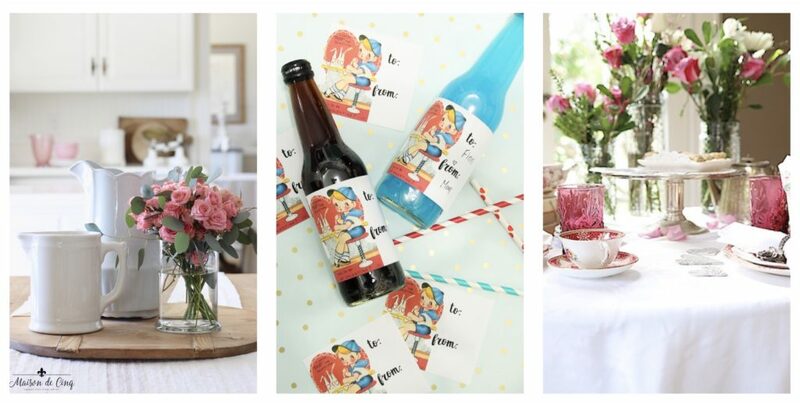 We love you vintage touches especially the French urn and breadboard and how adorable are the vintage valentine cards! LOVE! Aww thanks so much Kim!! 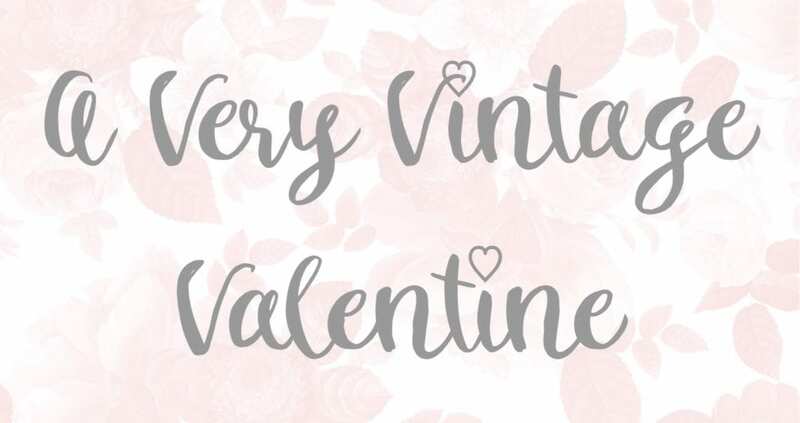 I love those vintage Valentines too! Hi Sheila! I just love those small little roses! I especially like them in your little French urn! I have an obsession with urns and I’ve lost count how many I have both for the indoors and out, ha! 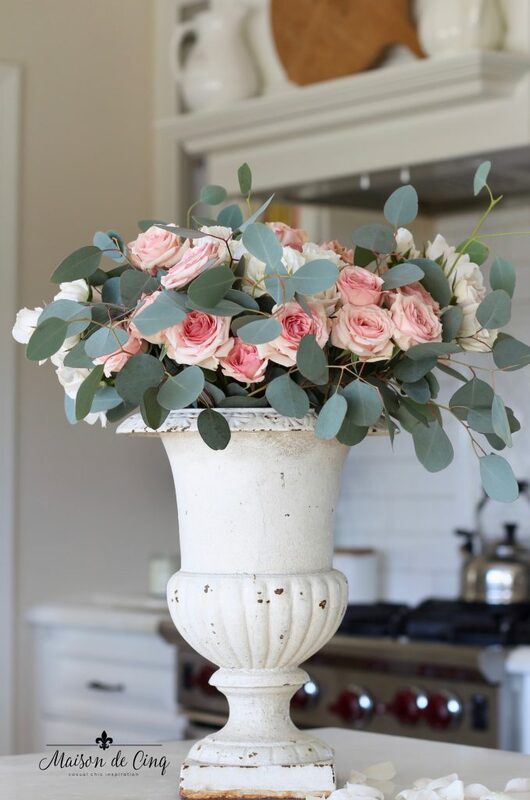 I just adore an urn with flowers in it! I think it looks very French country. 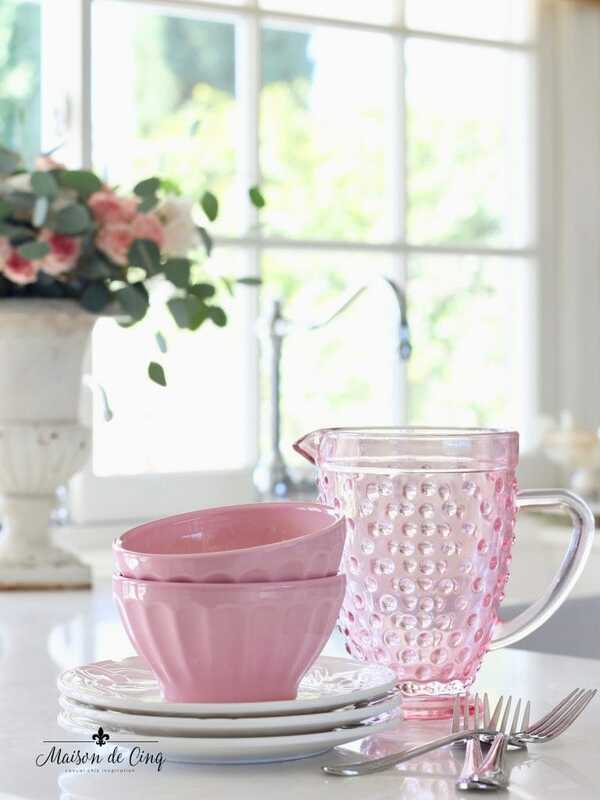 I love that pink hobnail pitcher you found, very sweet. I don’t do much decorating for Valentine’s Day either, being we’re empty nesters. I think you did just the perfect amount with your beautiful pink roses. Enjoy your week! 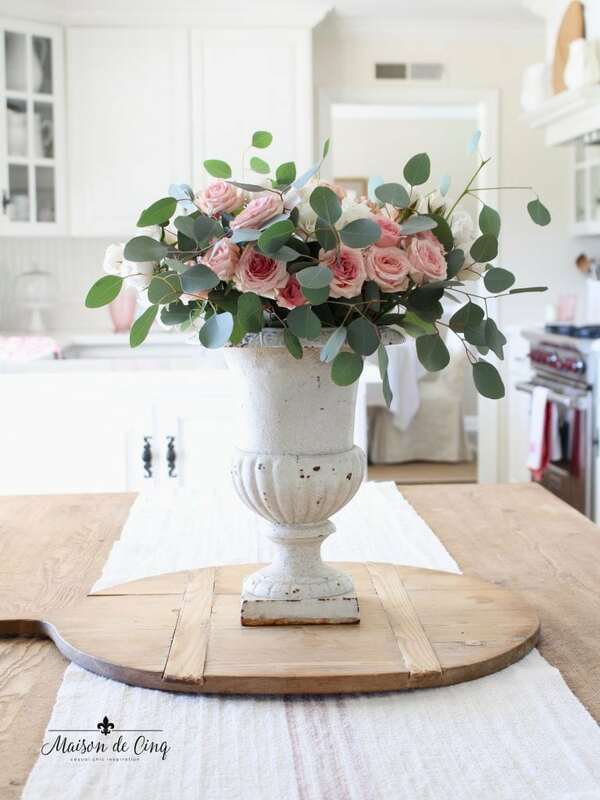 Ahhh, that vintage urn is gorgeous with the pink roses, Sheila! And I love those vintage postcards you scored on Ebay. Beautiful as usual, my friend. Aww thanks so much Jamie! Happy V-day to you! !